This article is also available in video form on Youtube. “ELF emmit draws upon the medical knowledge of the frequencies at which our brain works in different states of mind and encourages them to function at those exact frequencies.” So it encourages the ‘states of mind’ to work in different frequencies? I’m not sure. Generally, it is correct that if we measure brain waves, for example with electroencephalography, we find different types of frequency waves. When we are awake and alert, beta waves (13 – 30 Hz) dominate, when we get drowsy, more and more alpha waves (8 – 13 Hz) appear. The technique the EE uses is called Pulsed electromagnetic field therapy (PEMT). This means the EE creates a (small) magnetic field which sends out electromagnetic waves at certain frequencies and these frequencies are supposed to “encourage” the brain to work at similar frequencies. This is supposed to happen because of something called the Frequency Following Response (FFR). The Elf emmit team seems to think that if we send waves at certain frequencies to the brain, it will prduce waves at similar frequencies. Thus, if we induce frequencies that are associated with being awake, we will be awake and so on. However, the Frequency Following Response has almost nothing to do with the brain (as an organism) completely syncing its brain waves to input signal frequencies with similar brain frequencies. The FFR describes the encoding of a complex auditory stimulus (i.e. speech sounds or tones) in a very specific area of the brain, namely the brainstem. The FFR is used in research to test what changes when we are hearing impaired. Their scientific explanation does not apply to the EE’s simple simple low-frequency non-hearable signals, but only complex auditory signals. Further, the brainstem is not even the brain region the EE team claims to stimulate. Rather, the “ELF emmit is the only wearable that directly stimulates the cerebellum”. So since the EE is supposedly stimulating the cerebellum, it has even less to do with the FFR, which is originating from the brainstem. They want to stimulate the cerebellum because they say it “controls our body functions and is a link between our brains and the rest of the body.” This is correct in the sense that the cerebellum’s main function is motor control (i.e. body movements). However, the EE is not aiming to change the precision of your arm movements but rather it wants to change your entire mental state. This is a higher-order mental process. And there is a completely different brain region consistently associated with almost exclusively higher-order functions: the prefrontal cortex (see frontal lobe in picture) which is on the opposite side of the brain from where the EE is worn. So they should not even stimulate the cerebellum in the first place but rather the prefrontal cortex (for a better chance at success at least). Luckily enough, although they claim the EE stimulates the cerebellum, it really doesn’t. As can be seen from many ads on the website, the EE is worn slightly above the inion, which is the little bulge in the back of your skull). The inion has another name: external occipital protuberance. The name already gives away where it is located: not over the cerebellum but over the occipital lobe of the cerebrum. 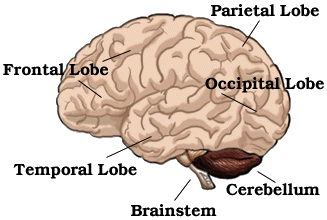 The occipital lobe is almost exclusively responsible for vision and the inion lies directly over the primary visual cortex. This is why locations around the inion are used by researches in combination with the similar but vastly more powerful transcranial magnetic stimulation (TMS) to make people see small light flashes. So, the most probable thing the EE does (if it does anything) is stimulating the primary visual cortex. But even the EE stimulating the visual cortex is extremely unlikely as its power is likely too low. Not even TMS can stimulate areas that are deeper than 5 cm within the brain, despite “typical peak coil currents in the range of several kiloamps and discharge voltages of up to a few kilovolts“. The EE’s power is limited to around 1 microvolt because it relies on the mobile phone’s output. This is a gigantic difference in terms of signal strength. The EE produces magnetic fields of the magnitude of “220 micro Tesla [0,00022 Tesla], that is more than enough to make an impact on the body, especially on cerebellum,” as can be read on the EE website. Likely, that’s just not enough power. Just compare this with the 1 Tesla a TMS pulse usually produces. The EE is about 10 000 times weaker. Some people say they get headaches from using the EE and use this as a reason to claim that the EE is at least changing something in the brain. However, the brain cannot feel pain, so the headache most likely comes from micro muscle movements in the skin right below the EE. But even if the EE stimulated the correct area with enough strength to have the desired effect on the brain, (i.e. brain wave frequency changes), we still wouldn’t know whether it “does anything” because scientists are not even sure that brain waves cause anything. Brain waves might be just a simple by-product of our cognitive processes. There is some evidence for the former but we are far from being sure yet. Taken together, this means that there is zero scientific basis for why the EE should function in the way it is advertised. The people who currently claim it works are probably falling for a placebo effect. But that’s not necessarily a bad thing because the relaxing or concentrating effect of using the EE is still real. It’s just not because of the device itself but rather the hopes and beliefs you attach to using it. Please let me know what you would like to be tested. Just because they got almost every aspect of the science details wrong, doesn’t mean its impossible for it to work. It is just very very unlikely. What shall I test? I am planning to do a blind study with some test persons and see whether their subjective reports change based upon what mode is used. Also I would like to combine using the EE with recordings of electroencephalography to see whether actual changes in brain waves occur but since this is not trivial, I will need some further planning. Please subscribe me to your blog about the Elf, haven’t gotten a lot from it either! Please subscribe me to your blog about the Elf. Hello. Maybee you must deeper research, what is FFR. then you will see, that ELF is a very useful aparatus and not only a placebo, sa you say. this article has zero reliable sources about anything other than the “response to complex auditory stimuli” I already dealt with in the article above. This is really interesting and thank you for this Marian. Do you know Halo sport ? (https://www.haloneuro.com/). It is a headset which optimized connections between brain and muscles. I would love to read some tests about Halo sport because it is the actual big thing for athletes. Thanks for your comment Jérémie. I didn’t know about the Halo but it looks intriguing. I will inquire them to hopefully get a test device. Thank you for this article It is really helpful. I am in search for the holly grail easy to use at home device and came across the Brainlink http://o.macrotellect.com what are your thoughts on this? I also wondered about the more famous Muse http://www.choosemuse.com. I would love to get your input on these. thank you for the comment and apologise my late response. Both of these devices seem to use a technique called neue-feedback to “train” your brain. There is a pretty big discussion going on about whether such techniques really work. I don’t know the devices myself but I asked for review devices and maybe I will get them. I was happy to find your article about elf. I understand that your evaluations are scientifically driven. You elaborated what seems to be contradictory within how elf supposedly is able to affect the brain using a certain technology and the scientific facts about the functionality of the brain, respectively particular parts/areas of the brain. I would appreciate it to read more about concrete results of tests you have carried out with test persons using electroencephalogram recordings. I personally can very well imagine that even very low energy magnet impulse can affect the brain. I do meditation using theta waves over headphone at quiet level. I do not own an elf device or have any experience with it. But I would consider to get one for myself if it works. I hope I was able to express my thoughts in an understandable way. thank you very much for your comment on this. I did not report results so far, because I haven’t carried out any tests yet. I can do behavioural tests soon. The problem when combining EEG with the ELF emmit is, that I can never be sure whether my signals reflect the signals coming from the brain or the signals coming directly from the brain. Fixing this problem computationally is not trivial so it is pretty time-intensive and I don’t have that much free time at the moment. However, I can start off with some behavioural tests soon. Can you tell with absolute confidence that 2.2 gauss at that specific frecuencies in that particular location, has no effect at all on any cell on the body? The burden of proof is on the ELF emmit team to actually SHOW that there is an effect, not on me. I cannot show you that there is no effect. Proving the absence of an effect is impossible. But I can say with absolute confidence that the EE does not do what they claim they do. While I am thankful for the theoretical review, I think this review would be a lot more useful for skeptics if it was backed up with actual testing, especially considering this is the first review that pops up on the ELF emmit when searching the web. Being a neuroscience researcher, you probably have the knowledge and the equipment available to help the layperson make an educated decision. Other people claim that their doctors could actually *see* its effect on EEG by comparing the graphing while using the ELF vs not using it, but I haven’t seen actual results. It’d be interesting to see that. If you’re interested in doing a more in-depth analisys, maybe reach out to the ELF team? I’m sure they’d love a scientifically backed review. I read somewhere that they’ve been approached by Yale to develop other programs. Thanks for the knowledge sharing session! I learned quite a bit reading this. Hi Milo, thanks for your comment! I couldn’t agree more with you, testing would be a major improvement to this article. I have already reached out to the ELF team and they were quite cooperative and sent me a review device. The issue with combining the ELF with EEG is the following: When you read the “brain activity” from the EEG, you can never be sure whether it’s actually brain activity or you are picking up the signal DIRECTLY from the ELF device. There are computational approaches for solving this (as we have the same dilemma with transcranial magnetic stimulation) but these rely on exact knowledge of the stimulation parameters (frequency, intensity, stimulation pattern) which the ELF team is not willing to disclose. I am trying to solve this and will come back to you. Have you already started with the test? I would be most interested in their claim to provide a good and deep sleep. As an insomniac for over 25 years I would do about anything to get a regular good sleep instead of the lousy 4-5 hours I get every Night. Dear Marian, thank you for taking the time to put together the data and produce the video. Although you didn’t carry out actual testing, there seems to be evidence that it does nothing but fill the pockets of the marketers. I have actually tested the ELF emmit in conjunction with a Muse. Which is a setup I could afford, not having access to actual lab equipment, ie EEG machinery. I ran multiple meditation sessions with and without the device to compare Muse recordings that are supposed to reflect brain activity. No difference measured. Now that you have a test device, did you measure the output directly using an EMF meter? That would be an interesting start. Hi Marian, nice article. This ELF device is doubting me too, as to I want to make a research for reducing anxiety in surgery. I use binaural beats and it has proven with many research before to reduce anxiety. What confuses me I never heard the use of PEMS/PEMFT for reducing anxiety and performing FFR. Instead, FFR is a result of binaural beats. When I’m trying to search any relevant studies about PEMS, they all related for something else, quite strange but seems like promising, PEMT has an effect on cellular of bone healing, some claim about pain and inflammation. Not sure because I’ve not read the articles yet. But yes overall I agree with you that this ELF device probably is wrong to manipulate brain mental state. I believe binaural beats is better solution for that. Thank you for this very interesting article and for writing in such an approachable manner. I initially came across this article only to confirm that the EE product was not legitimate, but continued reading to see the science which debunked the company’s claims. Is it not possible to create an isolated EEG baseline prior to using the ELF device and another one with the ELF device. If you had these two snapshots, I imagine that we could identify the differences before and after? I am curious about the device and I am unable to find any substantive research trials for it. I just got one about a week ago and I really like it. Re: sleep – I have been sleeping really well and I have amazing dreams. Can’t say much about the improved concentration, but the stress relief seemed to work today when I got some very upsetting news at work. I put it on and was able to calm down and finish writing the lecture I was working on. I don’t know if it works because I think it works, but I seem to be getting good results. After reading this I’d say, “go figure”. I see how I feel in another week ;-D Thanks much for this!! The ELF device is an extremely simple device. It it literally a single wire coil and no other circuitry; basic headphones are more complicated. The frequency and pattern will be simply determined attaching headphone wires to an oscilloscope and running the app. In terms of intensity, that will be determined by the audio amp in the device you are plugging it into. If you so desire, you can listen to the patterns with standard headphones. The main problem with that is the app is unreliable, on my phone it seems to pause after a single loop of the pattern. I am not a very knowledgeable person when it comes to science. But I would like to thank you for taking time into testing this kind of device and give a real, honest, scientific opinion on it. The world is full of fraudsters trying to take advantage of peoples weaknesses, I’m sorry but that’s how I see these kind of products. We as people, constantly suffer and constantly look for solutions for our problems, these kind of devices seem like candy and with all the complex marketing behind them they seem very genuine. We need the help of more scientist to debunk these things. I would like to ask you for an opinion on this device https://thetouchpointsolution.com/. The scientific opinion as the marketing one looks to good to be true. I was actually considering purchasing it for a suffering relative. But I am afraid that is just a fraud and it will just cause more misery. Thanks for an interesting and informative article on this device. On the advice of my neurologist I recently purchased a Cefaly TENS device in the hope that it might help me overcome chronic pain sensitisation syndrome which I unfortunately developed after an initially misdiagnosed High Flow Fast Flow Spontaneous CSF leak. The leak itself caused many issues including extreme head, facial and neck pain. After 18 months of misdiagnosis and then numerous invasive diagnostics and treatment attempts it has now finally been patched but I have been left with a number of neurological complications including 24/7/365 severe head and face pain. I’d love to hear any perspectives you have on the Cefaly machine and also look forward to your blind study results of the EE. As the pain also compromises my sleep I’m keen to know of any devices that may assist with that, deepen my meditation practice and assist with focus/concentration and memory as that has also been compromised. I am sorry for your situation and I hope you get better soon. I do not know much about migraines but the device itself sounds promising. It’s a very goody sign that they link scientific studies which support their claims so I think that there’s at least a good chance that the device will help you lessen the symptoms you experience. Thanks for this – would love to hear more about how your tests go. Thanks for your article on the ElF emmit, i have am an Adult with Adhd and have tried many things. And i can say that it has worked for me in many situations like performing situation reduce anxiety, and keep me relaxed. Music Practise, help with extended fokus where i usualy would have a monkey mind. Sleep has worked the least satisfying, but still works. So try to test it with a person with low attention span for study would give you clear results. I would also be very interested to talk with you about an other subject which is ADHD and prescripted Glasses especially for children, as there seems to be no awarenes with most Optometrist, that there can be a huge downside to wear fully corrected glasses for people with ADHD. from what i saw in your discription you work in the field of vision. Next story Can we learn to ignore objects in our visual field?